This is Cris in her Julia shawl in Jade Sapphire cashmere that she wore at the banquet Saturday night. Meantime, a few weeks ago, when I couldn’t get the computer to accept my camera card for http://spindyeknit.com/2008/02/berry-time-for-bigfoot/, it was a warning sign that the computer itself was about to blow. Which it did. (This is the WIP I was trying to show.) I quietly posted from a different one for a little while till the hubby fixed it, and laughed that, oh, well, maybe I was supposed to leave this shawl more of a surprise than that. Lyn used to manage Creative Hands, a yarn shop in Belmont. She moved to North Carolina after living here for forever and was sorely missed by her friends when she left. She came back this month to see a new grandchild and to hang around for Stitches, and you know the amount of time spent with an old friend is never enough. Lyn set up a–well, a play date is the best description I can think of–at Creative Hands for people who wanted more time to visit with her. Two, actually, and I got to go to the first, but for the second, I just couldn’t make it. There was an eye doctor who teaches at Stanford who had volunteered to speak that day to the lupus group I attend, and it was imperative to me that I be there. Crum. But that disappointment helped clarify what I needed to know, and then it just felt so obvious: that Berry Poppins colorway, how the pink and the purple melted into those soft fibers, those were exactly perfect for Lyn; I’d seen those colors on her many times. She loved handpaint yarns. And I knew. Lyn, stunned, opened it, stood up in slow motion, came over and threw her arms around me, wiping tears and saying it would be a comfort to her when she went back to North Carolina. Which is exactly what I’d wanted. For it to be a comfort and a reminder of her friends’ caring. Who were all about to pull off something major themselves for my own sake, and I just truly had no idea either till it happened. For me, this is what knitting is all about. Friends and caring. 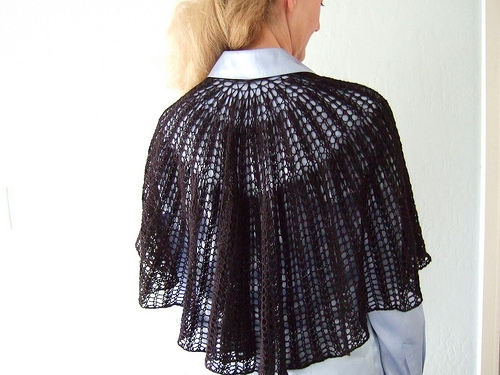 Cris’s shawl looks great, what fabulous drape! Love the pink & purple, but the story is even better. Berry wonderful post! I got your message at my blog… my email is practically none existent, but I’m going to remedy that today hopefully so blogger can act right for me. Thanks! I made it to row 17 of your Julia shawl this time before messing up. That is better than the last couple of tries. And I can see where my mistake is. The question is, can I get back there to fix it? We shall see. i love it when knitting has in it’s mind what it wants to be and who it wants to be knit for. lovely. truly lovely. A friend sent me here, upon learning I’d purchased your book. I’ve had a great time reading along while the CPA was doing his thing at my computer! Wonderful shawl–I’m sure she will treasure it!